Homemade bread fresh from the oven, and stuffed with ooey-gooey melted cheese. We were not disappointed. This is a bread you have to tear into as soon as it comes out of the oven because it looks and smells so wondrous. 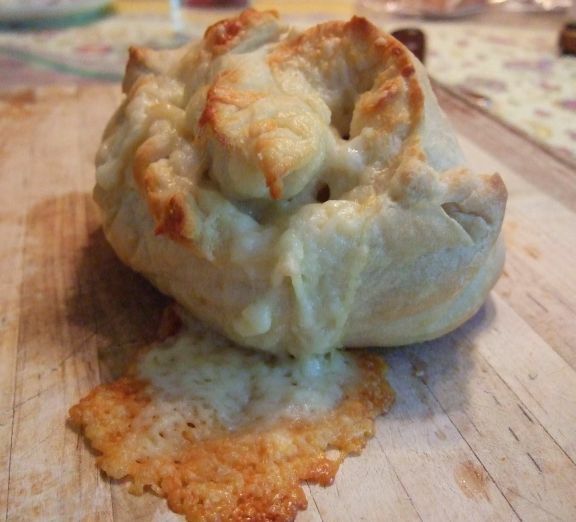 First-degree cheese burns are but a small obstacle to overcome in the pursuit of deliciousness. Shane, Jenny and I ate our way through two “mini” loves (which were, by no means, actually mini) in under 10 minutes. I sent one loaf home with Jen and the final loaf will be devoured tonight at dinner. I am so glad I got to bake in tandem (via skype) with these talented bakers; not only did I get to bake a fantastic bread and pick up some baking tips, I got to know these lovely, caring, kind and talented women a bit better. Yay food bloggers and yay cheesy bread! To make the starter: Mix the 1 1/4 cups flour, salt, yeast, and 1/2 cup water in a medium-sized bowl. Mix till well combined. (Note: it may look a rather dry. — LR) Cover and let rest overnight at room temperature. To make the dough: Combine the risen starter with the water, salt, flour, and yeast. Knead—by hand, mixer, or bread machine set on the dough cycle—to make a smooth dough. Place it in a lightly greased bowl, cover, and let it rise for 1 1/2 to 2 hours, till it’s nearly doubled in bulk. Gently deflate the dough, and pat and stretch it into a ¾”-thick rectangle, about 9″ x 12″. Spritz with water, and sprinkle with the grated cheese. Starting with a long side, roll it into a log, pinching the seam to seal. Place the log, seam-side down, on a lightly floured or lightly oiled surface. Cover it and let it rise for 1 to 1 1/2 hours, till it’s puffy though not doubled in bulk. Towards the end of the rising time, preheat the oven to 425°F. Gently cut the log into four crosswise slices, for mini-breads; or simply cut the dough in half, for two normal-sized loaves. Place them on one (for two loaves) or two (for four mini-loaves) lightly greased or parchment-lined baking sheets, cut side up. Spread them open a bit, if necessary, to more fully expose the cheese. Spritz with warm water, and immediately place them in the preheated oven. Bake for 20 minutes (for the mini-loaves), or 35 minutes (for the full-sized loaves), or until the cheese is melted and the loaves are a very deep golden brown. Remove them from the oven, and cool on a rack. Yield: four mini-loaves or two standard-size loaves.